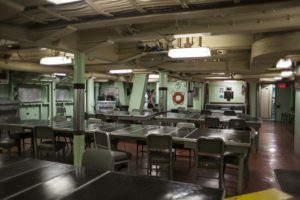 The United States Naval Shipbuilding Museum lets you experience life on board what was once one of the Navy's most powerful class of cruisers in the world. The USS Salem CA-139 is now the world's only preserved heavy cruiser. She is moored at her birthplace, the former Fore River Shipyard in Quincy, Massachusetts. It's the hands-on aspect of our program that make us unique. Our Adventurers get access to areas of the ship off-limits to regular guests. They even sleep in the same bunks used by naval personnel and eat in the same mess decks. So, are you ready for a Shipboard Adventure? Arrival: Meet Group Coordinator @ Guard Shack. Assign group ID’s to participants. We begin loading when your group is assembled. Orientation meeting on the Fan Tail. Please read enclosed material. 2:00-3:00 Tour of Ship: Tour Guides assigned by group ID during orientation. All participants line up for dinner on starboard or port side of galley. All groups must clean up mess halls! T-shirts, hats, patches available! Please remind your groups to visit the ship’s store. All groups must clean up the movie areas! Clean up and prepare for bed. Thank you for participating in the USS Salem Overnight Adventure!